“Cows inhale and exhale oxygen, says Rajasthan education minister” screamed the headlines after Vasudev Devnani’s comment at a lecture on the scientific importance of cows. He didn’t stop there, he went on to say that Newton didn’t discover gravity, but Brahmagupta II did, and that cow urine can cure cancer. Devnani should by no means be singled out, however, because his fellow BJP party members seem to all be competing to see who makes the most bizarre claims about science and history. Narendra Modi has claimed that genetic science existed during the Mahabharatha, citing Karna’s in vitro birth as proof, and that plastic surgeons were responsible for Ganesha’s elephant head. 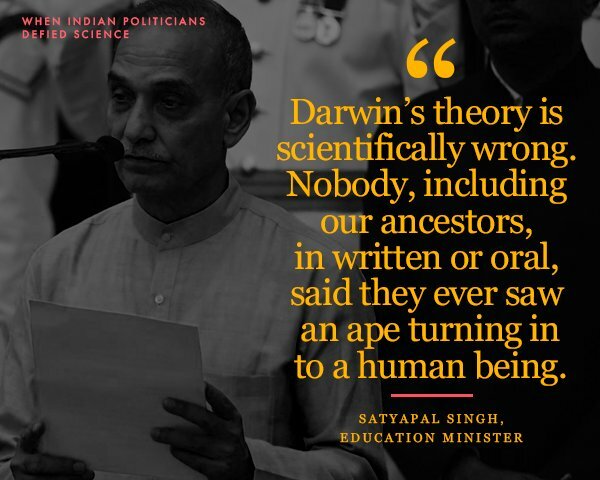 Other BJP leaders have added to the noise by saying that Darwin’s theory of evolution is wrong because no ape ever turned into a man, that nuclear weapons existed in ancient India, and that yoga can cure cancer. It’s tempting to brush these statements away as cries for attention. But these leaders have the power to decide funding for scientific research, and the direction the research will take. In the midst of a shortage in funding for scientific research in India, there are attempts to push the direction of research towards proving some of these claims. Last year, The Hindu ran an article that mentioned that IIT-Delhi received numerous proposals from institutes like the Council of Scientific and Industrial Research (CSIR) to study “the benefits of panchagavya.” As the article then goes onto mention, the problem is not with studying panchagavya itself, but with it being a push from the government to not explore it objectively, but to steer research towards the governments priorities. What BJP leaders are trying to do here is use science as a tool to further their narrative of nationalism. The basic idea here is not new; Homi Bhabha and Jawaharlal Nehru both drew from the zeitgeist of their times, that of a new, independent, progressive India, to promote scientific institutions and a scientific temper. Fast forward to the Cold War and we see Nehru spearheading the Non-Aligned Movement. For him, scientific advancement was a matter of national pride as well as a tool for India’s development. He also wanted to show that India deserved a place at the table when it came to scientific research, and that its independence from the British did not leave it devoid of intellectual capital. Bhabha and Nehru both used science as a tool to build a nationalist narrative, but for both of them, science was more personal than that. As a scientist and then an administrator, Bhabha saw the importance of building strong institutions of science in India as a step towards nation building. Coming to Nehru, “scientific temper” is a phrase that is often associated with his ideology. Not only was it important to build scientific institutions in India, but there was also a need to create a universal culture of science that everyone was a part of. Coming back to the BJP, while the basic idea might be the same, the agenda could not be more different. Theirs is an agenda completely divorced from the scientific temperament, and one focussed on the greatness of ancient India, the glorification of cows, and the superiority of Hinduism in general. What’s interesting here, however, is that they choose to use scientific language to make these unscientific claims. The concern here is not so much about whether these claims are true or not, because when we enter into the territory of Ayruveda, pachagavya, gaumutra and so on, it might just be the case that there is a chemistry that we aren’t aware of just yet. What is interesting is the framing of ideas that have mythological or ancient origins in a scientific way. This leads us to ask why they think the manipulation of western science is the way to promote a so called “Indian science.” Why does Ayurveda, a well-practiced system of medicine, need the sanction of western science? Why do Karna’s birth, Ganesha’s head, and vayu astras need to be explained by science at all? Why not say these ancient practices are beyond our understanding today and leave it at that? The BJP knows this. They know that a good way to sell their agenda is to package it like it is science, like it is something kids should learn in school and something that should be featured in the science sections of newspapers. Where the middle class gets their science from, basically. But what will this ultimately lead to? However they might try to package it, their claims are not scientific. Their claims create an atmosphere of noise in which it is very hard to find clarity, and one which will erode any scientific temper we might have as a society. For Bhabha and Nehru, science went beyond being just a tool. But for those in power today, science seems to stop at being a means to achieve an agenda, and not an issue that deserves attention in terms of funding and policy. They’ll make sure science is in the headlines, yes, but only as long as they need to use it. ← Supply and whose demand?